Find hotel near The Links At Crowbush Cov .. This course is beautifully manicured with spectacular views of the ocean. If you love to golf and are on the island, a golf game at this course is highly recommended. The course was opened in 1993 and has beem rated in the Top 2 Best Value Golf Courses in Canada .The course was designed by Canadian architect Tom McBroom. The golf course has a five star rating and affords brilliant vistas from all around. It is approximately a 25 minute drive to Charlottetown. How popular is The Links At Crowbush Cove? People normally club together Confederation Landing Park and The Mack while planning their visit to The Links At Crowbush Cove. Top notch! This is one challenging course! Also one of the most beautiful.. Ocean for days! After your round, go test drive Chef Jesse Mac at Crowbush Resort.. you won't be disappointed! Amazing golf course. Played mid July and the weather was excellent. Course was in immaculate condition. 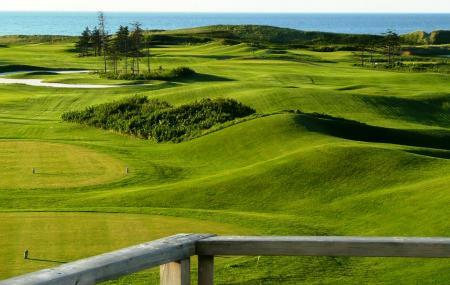 The Links at Crowbush Cove is rightly regarded as the flagship course on Prince Edward Island. Excellently maintained and presented, this easily walkable Tom McBroom layout winds its way through tree-lined wooded holes, before heading out to the sea in stylish links-golf fashion. Along the way is a fabulous variety of beautifully crafted holes. Beautiful grounds, friendly, able staff and reasonable prices too!